Florida is the sunshine state! We expect it. Sunshine that is. We like it. Our winters are even full of sunshine. We've come to know we will enjoy sunshine at some point even on rainy days. Our rains almost always come in the form of a thunderstorm. You know the kind that form, blast through the area and then clear out in a short while. Thank goodness for the rain. Our rainy season usually starts in June. In the previous post we gave great attention to the abundance of rainy days we've had this week. We are very grateful for it. It is raining again as write. 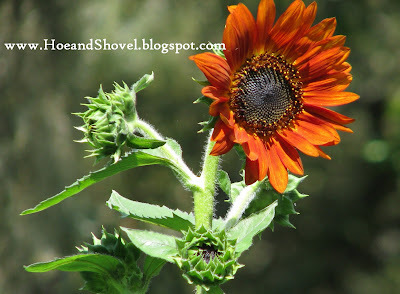 On one of the rainy days this week with only cloud cover to light the garden I noticed the first bloom on the sunflower. Yes, THE sunflower. When the vegetable garden was planted a few sunflower seeds were sprinkled in between the zinnia seeds that are in between the green beans and the pole beans. ONE lone plant has made its way out of the earth standing a good 9 feet tall. So powerful it looks with its giant leaves and thick stalk towering above the pole beans and the tomatoes. The following day it fully opened and numerous buds can be seen waiting for their turn to open along the length of the stalk. Truthfully, I'm not a huge fan of sunflowers. So for my first-ever experience with them I ordered seeds of the variety Autumn Beauty from American Meadows. It's possible I misunderstood. I thought the height of the stalks would be shorter and the flowers smaller (which they are) than more commonly seen cultivars. It's okay though. I'm glad the flowers are smaller even if the stalks are way taller than I imagined. I'm thinking these flowers are going to long outlast the vegetables plants and it will be nice to see them when the veggies are gone. I might even plant some more. Would love to see the red ones and the browner ones promised with this variety. With only spotty rain Friday and Saturday I was able to work in the garden all day both days. It was so glorious to be outside after three days of very little gardening. Even though we were back to temps in the high 80's it was bearable gardening weather with mostly cloudy and overcast skies. This is a view from the vegetable garden standing next to the carrot-lettuce-onion bed looking west toward the front/side yard. 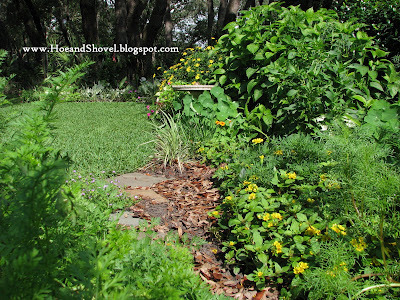 You can see how the landscaping flows right into the vegetable beds. 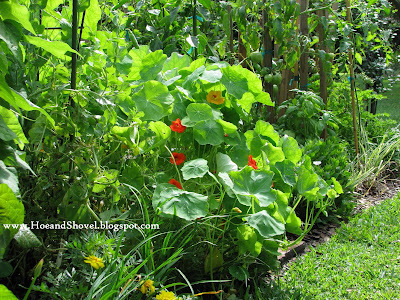 As the vegetable garden begins there is a wide swinging curve creating the beds of homegrown goodness. The transition bed (partially visible lower right) begins the veggie garden by mixing plants of sweet peppers, tomatoes, allium and blueberry in with the perennials and annuals. There has been no lack this week of fresh lunches picked and prepared straight from the garden. It is difficult to know at this point how long the veggie garden will produce those yummy slicer tomatoes. The soil is reaching some high temps even at night and some of the vegetable plants just won't tolerate it. 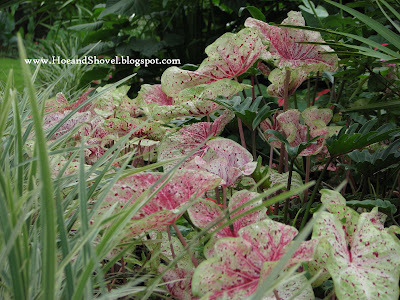 Caladium bulbs left in the ground from year to year have taken advantage of the generous showers. My favorite species Miss Muffet is displayed here in the front/side garden. They are popping out of the ground and brightening up the landscape at rapid speed now. In the back gardens I managed to plant 100 more White Queen variety (in the rain) like the few seen in the photo above. There are more to plant... this week hopefully. Mr. Meems brought me a fresh cup of coffee mid-morning yesterday. We sat in the garden together enjoying the shade and remarking at the expedited growth this week. Above is the view to the east from our resting place in the middle of the back garden. Another view looking a little further over in the north east direction. If you look to the top left corner you will see a peek at a portion of one of the new beds I created this spring. Taking this photo reminds me I haven't even shared that process and the new bed with my dear readers. It is full of native plants. I promise to get on that soonly. Oh my, there is always so much to do. Butterflies wondering what's with all the rain were dancing about in between the downpours and spurts of sunshine. 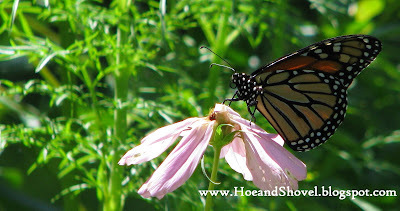 This one, a monarch, resting on a rain-battered pink cosmos. I should sit down and have coffee right in the middle of the garden with Mr. Meems more often. It is amazing what one will notice from the sitting position. 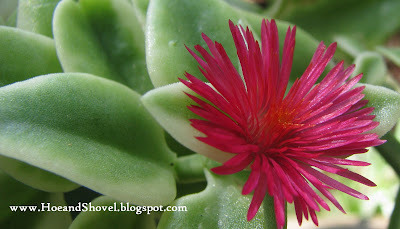 The tiny and intriquing little bloom of Mezoo Trailing Red Dorotheanthus plant is certainly not flashy but all the same as lovely as any larger bloom. A friend gave me a few sprigs of this wonderful succulent that roots very easily pushed down into the soil and watered until roots are formed. It has become a favorite for its ease of care as well as attractive light green foliage and trailing habit. The wonderful rains have refreshed the earth in Florida. It is a blessing to have our gardens replenished with the heavenly liquid that perks up every living thing. Water from irrigation can only attempt to imitate the pure soaking goodness of natural rain water. 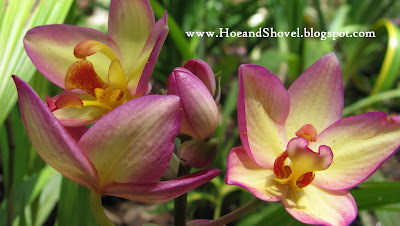 Ground orchids are shooting up their pretty blooms. New to this garden, these were purchased late winter on sale and split up to make two. Both are blooming. The plan is to add more now that I know they are sited correctly. Not being sure what color flower they would produce I'm pleased they showed up in pale yellow and lavender. I hope you are all enjoying your Memorial Day weekend AND your gardens this beautiful month of May. Thank you for coming by to visit and for walking through my gardens with me. 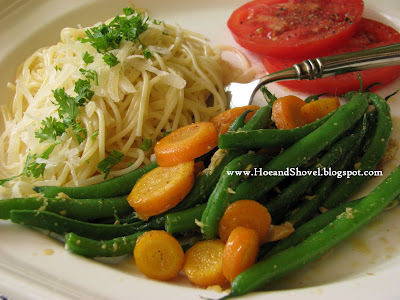 Love the color of that sunflower, your veggies look great on that plate. I have been looking for Ms. Muffet, and my mezoo has blooms on it too........Enjoy your sitting time and coffee with Mr. Meems, how thoughtful of him. I haven't had much luck with sunflowers in the past. I am trying again this year. Yours is stunning. Your garden looks very happy. My herb garden is looking a little waterlogged actually. Have a nice holiday weekend! The rain this afternoon was something,wasn't it? Our veggie garden is starting to slow down these days.Only one of the tomatoes is still producing, but they are smaller.The eggplants are going great guns,tho. What AMAZING photos, especially of the sunflower. Loved them. So lovely, Meems. The rains began here just as we left for Texas and it seems like it has been raining since we returned. What a delightful change. Your gardens and photography are just beautiful. Have a great evening --and Memorial Day.. I have been seeing all the reports about the rain in FL. I am glad it is enhancing your garden so well. Seeing your caladiums reminds me that I put a few in my window box the other day. I will have to post about them. They remind me of you. Beckie even mentioned you and your garden when she saw them the other day. Hi Meems~~ It seems like Florida flowers are much more succulent and colorful than the more temperate ones. It is nice to just sit down once in awhile and take it all in. Even better with hubby. Will your pole beans climb the sunflowers? I do love that orange bloom! I guess your rain is headed our way for this week. It looks like days of rain in the forecast. Your fresh veggie plate is so colorful, beautiful and I'm sure the flavors are incredible! Glad you and Mr. Meems are taking time to sit in the garden and enjoy the peace and beauty of it all. I followed you here from Aunty Belles Back Porch .... what a treat to visit this beautiful site! 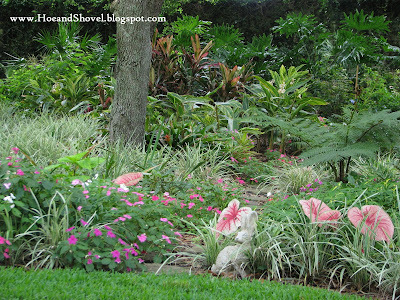 I still miss the lush gardens of Florida. 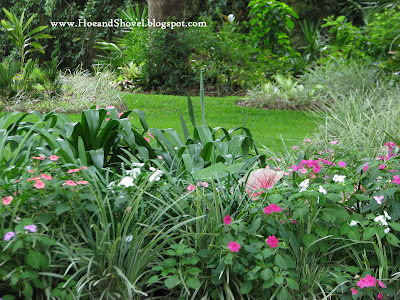 Up here in Zone 7 we do have some beautiful gardens but it just does not have the colorful lushness of true old Florida love yards. I've brought some of my Florida favorites up here from time to time, but often lose them to the cold. This year I brought home some Plumbago and planted it in a big pot in hopes I can move it inside for the Winter. Hi Meems, your garden looks great even with all the rain. You must have not gotten as much as we did here. All that rain is very good for the plants but all that I planted in the ground is history. Too late to start over as the hot summer sun is upon us. I hope you had a lovely Memorial Day & enjoy your visitor. 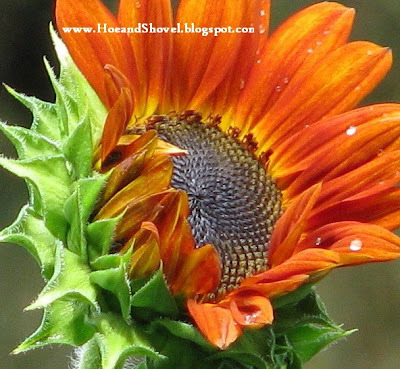 Love, Love, Love that orange sunflower.. 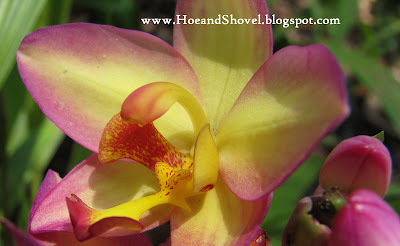 I do love to visit your blog garden. It is always so lush and floriferous. If you can only have one sunflower. This is the one to have. It is so beautiful. beautiful capture of the sunflower...but i am loving seeing it in person. your garden is a true delight. Lovely as always! I like the sunflower...although 9 feet is awfully tall! You always get such wonderful butterfly shots and this one is no exception.